Get ready for a true Art Feast today! What a busy and inspiring couple of months it has been with all of Finnabair’s beautiful new products being released. 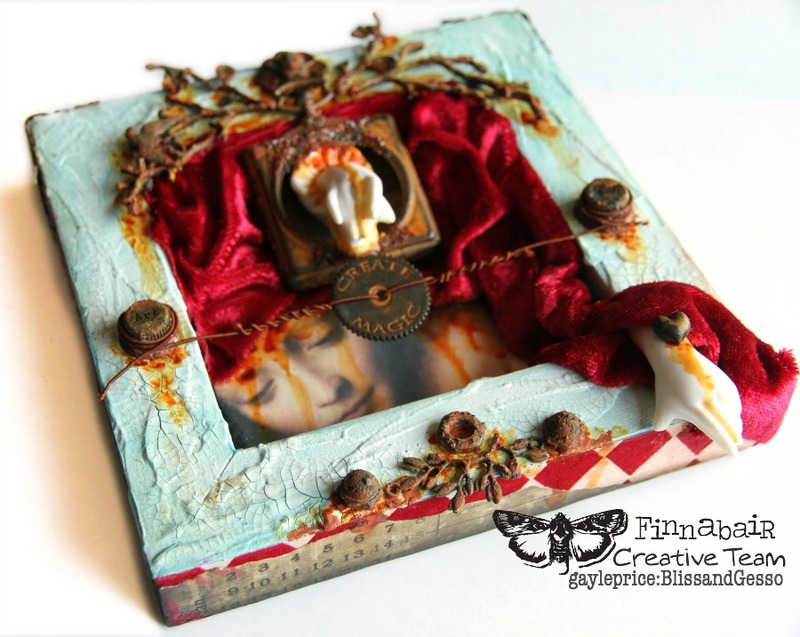 I have made a composition within a small wooden frame using Finnabair’s beautiful new Rusted Pocket Watch as the centre piece. All the new “rusted” Mechanicals are amazing, and what is equally amazing is the new Rust Effect Paste. 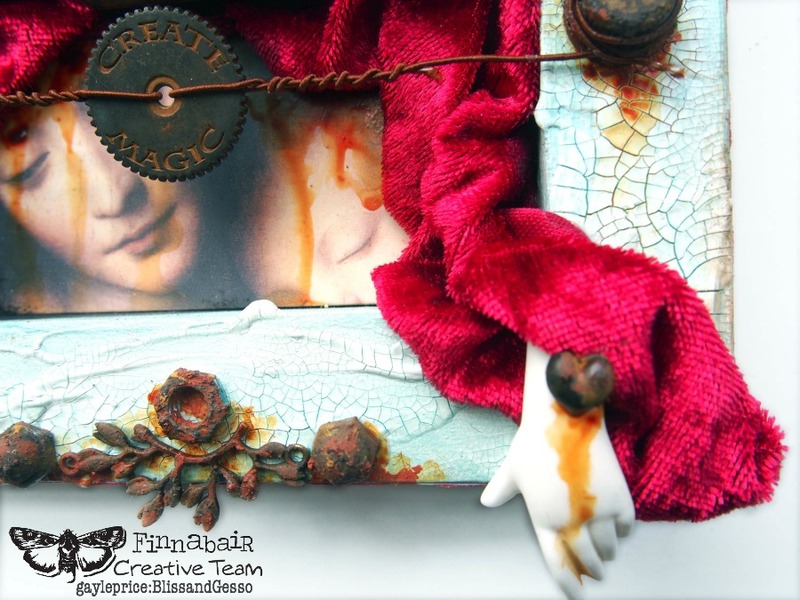 This paste allows you to “rust up” any embellishment you want, whether it's silver, plastic, or resin and they then blend in perfectly with the ones already created by Finnabair. I have always been a fan of the White Crackle Texture Paste and after applying it to the wooden frame, I painted it with one of the new Art Alchemy Acrylic Paints - Light Patina, such a soft and pretty colour. 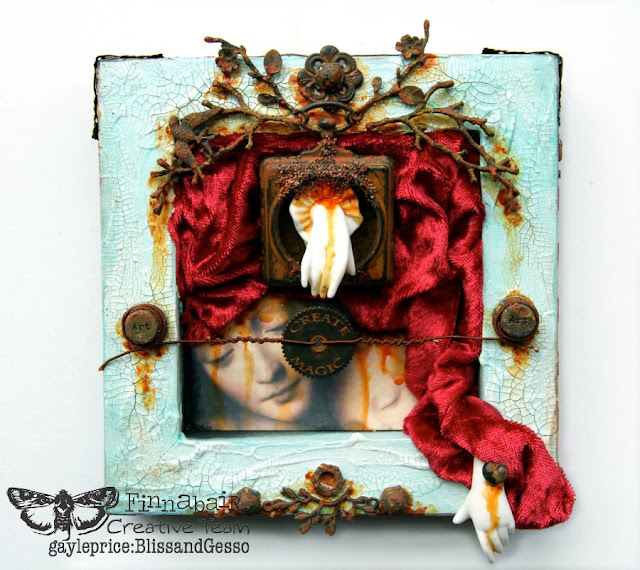 My project is a bit of an eclectic mix of textures and styles: a mix of opposites, velvet and rust, grungy metal and elegant porcelain hands, the softest patina blue and the deep, rich burgundy. The other new product I played with was Art Extravagance Sculpture Medium which allows you to sculpt paper or fabric into shapes or forms and once dry, it holds that shape. I used the back of a wooden board that you paint on. To give the velvet a “framework” to rest on, I coated some paper towel with Sculpture Medium and moulded it into the space where I wanted the velvet to be. Once the Sculpture Medium had dried, everything was given a coat of White Gesso. The timber frame was coated in White Crackle Texture Paste and allowed to dry and then given a coat of Art Alchemy acrylic paint. 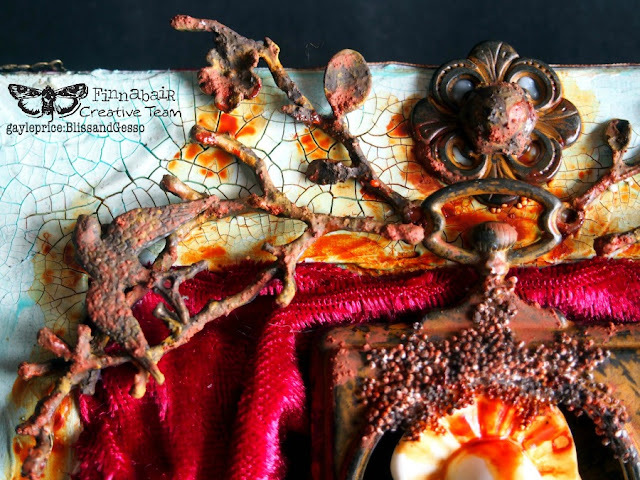 Metal embellishments I wanted to use that were not from Finnabair’s range of Rusted Mechanicals, were given a coat of Rust Effect Paste. This works brilliantly and so easily. Using a small paint brush I dabbed on firstly the Brown Rust followed by the Gold Rust and then the Red Rust without waiting for each colour to dry in between. Then it was just a matter of using some 3D Matte Gel painted onto the moulded paper towel and positioning the velvet over it, creating gathers and folds as I went. All the metal embellishments were stuck down, also using 3D Matte Gel. I added patterned paper around the sides. To added a little more “corroded rust” texture, I used Art Stones and coloured them with Rust Effect Paste. I hope you get a chance to play with some of these new mediums, will be inspired by them and explore the many possibilities they present. ( and have a truck load of fun! ). WOW Amazing. Always inspiring! Love the rust paste. Wow!!! Amazing project!! !I love it!!! Gayle, I love this, it's beautiful! Gayle - I always love your gorgeous and unique pieces! Gayle - I love this piece. Beautifully done. Awesome... Love your art. So original and unique. You are so extremely talented. Thank you for sharing your fabulous art. Fabulous art piece Gayle, very inspiring. LOVE IT !! !